Mr Bowyer said he was "pretty shook-up" by the sighting. "This is not something you see every day of the week - it was pretty scary," he said. At first he thought it was the sun reflecting from greenhouses in Guernsey. He said the objects were bright like the sun, but did not hurt his eyes when he looked at them. The stationary objects were also observed by other aircraft and the passengers on the plane. John Spencer, deputy chairman of the British UFO Research Association, said: "These types of sightings have been reported by pilots - generally accepted to be reliable and sensible observers - since the 1940s and they have excited attention to this day. 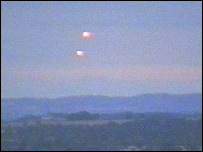 "Such light effects are often popularly thought to represent alien visitors but many UFO researchers believe they more likely represent natural, atmospheric, phenomena not yet fully understood by science. "However, a similar encounter in 1978 over the Bass Straits in Australia, where the pilot was in radio contact with the ground throughout, resulted in the pilot never being heard from again, so these phenomena are important to study." Nick Pope, who used to investigate UFOs for the Ministry of Defence said: "While no witnesses are infallible, pilots are trained observers and less likely than most people to misidentify something mundane. A current spokesperson for the Ministry of Defence, said that while it does monitor air space for any unusual foreign objects which might pose a threat, they would not be carrying out an investigation in this instance.